Sun Yu goes rushing into the hospital as she must see for herself if that is really Jin Yu. Unfortunately, she manages to just miss her sister, so while she has her suspicions, she doesn’t know yet that her beloved eonni is pregnant. She then recalls she is supposed to be with her ward from the orphanage and rushes off. LOL. I really want to know how she will handle revenge when she is such a forgetful person. Meanwhile, Jin Yu is seeing the doctor who is scolding her for not coming to the hospital five months ago. Jin Yu explains that the pains are gone and she’s fine, but that isn’t the problem. Apparently there’s an acid buildup which could be very harmful to her and the baby which wouldn’t have been so exacerbated if Jin Yu had a simple surgery months ago. Figures. The doctor wishes to hospitalize Jin Yu, but the woman refuses and decides to go into the hospital several times a week instead. The weak and depressed Jin Yu takes a seat out on a bench and flashes back to probably her last meeting with Tae Jung. He says he wishes to break up with her. Jin Yu is in a state of shock and immediately wants to know what she did wrong so she can fix it for later. This angers Tae Jung. She has done nothing wrong, she’s a good woman. He’s just tired and doesn’t love her anymore. He explains how Jin Yu is too much like him and thus he never saw a future in front of him beyond the lot in life that he hates. But thanks to his meeting Ji Hee, he sees a future where he can be greater, where he can fly. Jin Yu then reveals that she is pregnant. This makes Tae Jung livid. Fine. If she wants to hold onto him this way, he might as well kill himself. Jin Yu is horrified that he has such thoughts. Tae Jung pushes her towards having an abortion to save him. This way he won’t hate his child and can think about it’s death with regret every now and then in the coming years. Omo. I can’t believe he said that! And how violently angry he got? What right does he have to be so self-righteous? And what makes him think the life that Ji Hee has is all that he’s got it glorified to be? In fact, we do see how unhappy Ji Hee is with the state of her family life. That is neither here nor there. I have a song dedication! It’s been awhile. I think Tae Jung needs to learn from Chad Brock’s “Ordinary Life”. In that song, the man leaves his wife and kids because he has bigger dreams than the prison of his ordinary life. Lo and behold, he eventually realizes that the best thing is that ordinary life he disparaged. I hope that when Sun Yu enacts her revenge she makes him realize all he could have had—kind of like Christopher Plummer’s character realized just before he killed himself in Nicholas Nickleby (I love Dickens movie adaptations!). Ji Suk is soooo cute. He’s like a little chick, lost without its mommy. He’s bumming around the convent yard wondering where Sun Yu has wandered off to. He catches sight of her returning after kicking a broom and quickly sits down on a bench. Sun Yu asks after his ankle and he insists that it is still painful to walk. Sun Yu kneels on the snowy ground, shocking Ji Suk. He tells her to get up, but she doesn’t listen and keeps groping his ankle and thinking how strange it is that the swelling has gone down so much but he still insists it really hurts. Ji Suk quickly pulls her to her feet. He then asks about his precious compass. The absentminded woman then recalls that she is supposed to be looking for it. She then asks if it is not possible for her to buy him a new one instead. Ji Suk tells her he doesn’t think she can afford to do so. Why? Is it really that expensive? Selling the convent wouldn’t even get the money to buy it. This shocks Sun Yu. How can it be so expensive? Ji Suk says he’d love to see if she can buy such a compass as it is the only thing he has that belonged to his mother—that’s how precious and priceless it is. This, of course, makes our nun-in-training feel really bad. She tells him not to worry as she will definitely find the compass. She bows and walks off. Pong Ho is happily working in the kitchen of his restaurant when the angry Bong Hwang comes in. The kimbap chain store nearby has her worried that they will lose out on business. She then wonders if they should ask Tae Jung to set them up in a branch store. That being decided, Bong Hwang and Poong Ho go to L Foods to ask him in person. At the company, Ji Hee and Tae Jung are disgustingly flirting in the office. He asks if things were okay at home, but of course they weren’t. She got into trouble big time. The two leave to go to a meeting just as Poong Ho and Bong Hwang arrive. Poong Ho sees him and the couple chase after Tae Jung, only to just miss him. They then overhear L Food employees gossiping about how the rumors must be true that Ji Hee and Tae Jung are dating. This is quite the blow to the Heos. At the Jang house, Dal Nyeo and Tae Mi [Jung Yi Yun] gossip about just who it is that Tae Jung is dating. Tae Mi compares herself and her mother to be fox types and Jin Yu to be a bear type. Before they can wonder any further, the Heos are beating at the door. Bong Hwang immediately starts questioning and accusing Dal Nyeo. The woman is super happy to learn that her son is dating the company’s chairwoman’s daughter. It’s kind of sick for her to be chortling happily about this while the Heos are there demanding to know why their precious niece Jin Yu is being cheated on. Dal Nyeo jumps to her son’s defense and says that Tae Jung said he broke up with Jin Yu before she left for China. This surprises the Heos as, of course, Jin Yu has kept this all one big secret. While I do understand to an extent, I really don’t like Jin Yu’s decision. I loved how when Dal Nyeo was complaining about the angry Bong Hwang ruining her clothes, Bong Hwang had to point out that it was Jin Yu who bought then for her mother-in-law-to-be. Meanwhile, Madame Gong is trying to find her grandson. So far, no such luck. She orders to have him found as soon as possible. It appears that Ji Suk was in the middle of securing a deal for the company in America when he received a call from Korea and came back without letting anyone know. Suspicious. At this time, her wayward grandson has found his way into Sun Yu’s room as she promised to mend his clothes. He sees the freshly laundered clothes on the floor, but they have yet to be mended. Ji Suk then sits down at her desk and looks at the picture of her and her eonni before searching her drawers for a needle and thread to fix his clothes himself. Wouldn’t you know he finds his missing compass? What a shock, it’s been in Sun Yu’s drawer the entire time. That absentminded nun-to-be. The forgetful Sun Yu is desperately searching the mountain again for the compass. The snow starts coming down harder and she prays to God to make the snow stop so that she can find this precious item. Enter Ji Suk who watches this display from afar. He’s falling for our little nun more and more, you just know it. While searching, Sun Yu sees something shining on the ground, but Ji Suk stops her. She is surprised to see him. He scolds her for digging around with no gloves—look at her poor red hands. Sun Yu then kneels down once more to see if it really is the compass. Ji Suk pulls her up again and kicks the shiny object with his toe. See? Just a piece of wood. This upsets Sun Yu. Ji Suk then tells her to come down with him. She notices how he’s walking and asks if his foot is better. Ji Suk quickly starts to hobble a little and yells back that his foot still hurts. Back in his room, he feels badly about how hard Sun Yu is looking for the compass that is now back in his position. Since I Suk absolutely needs to stay a few more days, he decides to keep this a secret until he finishes what he came for. Sun Yu returns to her room where a nun complains about Ji Suk. Sun Yu defends him and says that he doesn’t seem like a bad person at all. Awww. Looks like she’s warming up to him, too. She then asks after Jeongi and the fellow nun says the girl is doing better. 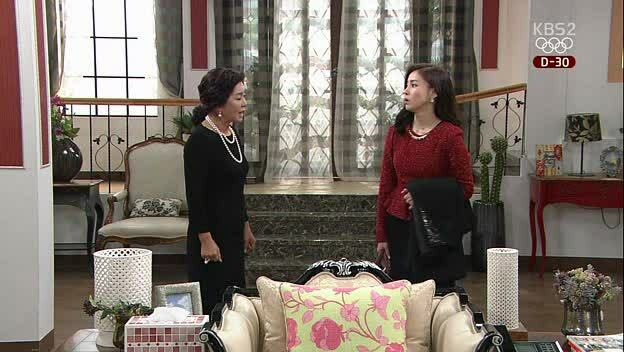 Sun Yu promises to go to the hospital to look after the teen later. She then gets an urgent call from her upset aunt and uncle. Sun Yu rushes to meet with them and they apprise her of just what transpired that day. Sun Yu cannot believe that Tae Jung broke up with Jin Yu and is seeing someone new already. She then recalls the pregnant woman who looked like her sister. She tries to shake these thoughts and decides to go directly to Tae Jung to hear his side of things. She calls him up while he’s having dinner with Ji Hee. He ignores the call and this makes Ji Hee curious. Could it be another woman? Tae Jung doesn’t rise to the woman’s bait and just passes her his phone. This upsets Ji Hee and she refuses to look at it. Just what has this man done to her good senses? She’s angry, but this amuses Tae Jung as he finds this behavior of hers to be cute. If she turns into the crazily possessive type later, he won’t find that so cute. Let’s hope she does so he can burn in misery. Meanwhile, her mother is having her assistant dig up all she can about Tae Jung. Tae Jung goes home to find Sun Yu waiting at his door. The two go to a coffee shop and Sun Yu asks for his side of the story. Tae Jung repeats again that he has broken up with Jin Yu and has found someone new. He scolds Sun Yu for calling him “brother-in-law”. That’s right, he was never her in-law, was he? Should she just call him “oppa” like she used to? Tae Jung doesn’t say yay or nay so she does as she pleases. Sun Yu really can’t believe that her sister and Tae Jung have broken up for good. She is also a bit concerned with a comment that Tae Jung said about Jin Yu had better not try to hold him down after she promised to “get rid of it”. What an arse. He backtracks and tells her its nothing and that he has nothing more to say and she had better never come see him again. Harsh. The next day Aran complains to Ji Hee about Tae Jung’s less than stellar background. His mother had him out of wedlock, married a different man, and runs a bar. Ji Hee doesn’t care about his past or his background, but that doesn’t placate her angry mother. Enter Jung Soon and Woo Hyun. The argument stops and Ji Hee leaves for work. Jung Soon asks what is going on, but her daughter-in-law won’t say. Meanwhile, Dal Nyeo calls up her son to ask about his girlfriend and get the scoop. Tae Jung is angry that she has found out and tries to stop her from coming to the office to see him and meet Ji Hee. Ji Hee comes up and asks to talk to him. The two go outside where she asks about his past. Tae Jung doesn’t lie. He says his mother is a bar woman and that she had him before she was married. These are things that he didn’t really want to bring up himself. Ji Hee thanks him for his honesty. Since he was truthful with her then there is no way he is using her, right? Snort. Right. I don’t think he’s that innocent, but you never know…Nah, he’s not that innocent, nope, nope. How can he be when he told his ex to get an abortion otherwise he’d hate the child for life? We end with Sun Yu hanging up laundry at the convent (I’ve seen these scenes where people put clothes out to dry in the middle of winter and never understood it myself…your hands turn to icicles and the clothes freeze and don’t really dry). The wind blows and her hat thingy comes flying off. Ji Suk happens upon this scene and seems quite taken with the natural beauty of Sun Yu. Ah, such a cheesy and typical scene, but cute nonetheless. I’m ready for Sun Yu’s revenge. Tae Jung hasn’t even done the worst he could do, but he’s more than proved that he needs to be spanked…badly.